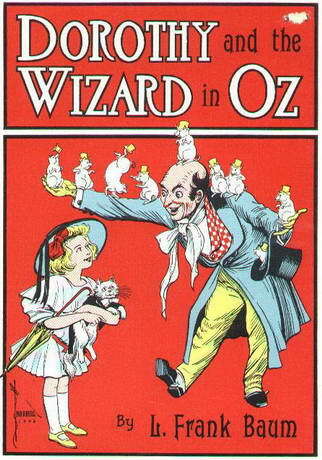 Dorothy and the Wizard in Oz was the fourth of 14 Oz books written by L. Frank Baum (1856-1919). Published in 1908, while Baum was resident in Coronado, California, it is considered one of the “darker” of the Oz tales. However, it also is enlivened by Baum’s considerable wit, penchant for puns, and dry social commentary. In this title, Dorothy, her kitten Eureka, Jim, a cab horse, and Zeb, a ranch hand, descend into the earth through a rift opened by an earthquake. There they encounter the “humbug” wizard who once ruled Oz. In their journey back to the earth’s surface, they meet a number of potentially dangerous magical peoples and creatures including the cold-blooded Mangaboos, invisible bears, the flying wooden Gargoyles, a den of dragonettes, and an eccentric inventor. With a little help from Ozma, the group end up in Oz where they are treated to feasts and celebrations. The animals end up humbled by a few of their experiences in Oz, where all animals can talk, and return home a little wiser.